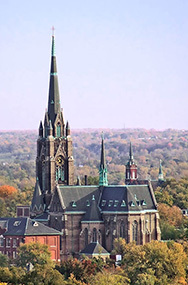 THE CARONDELET neighborhood is one of the oldest and most distinctive areas of the City of Saint Louis. Founded in 1767, it was named after Baron François Louis Hector de Carondelet, the Spanish governor of Louisiana; it became a part of the United States in 1803 with the Louisiana Purchase. 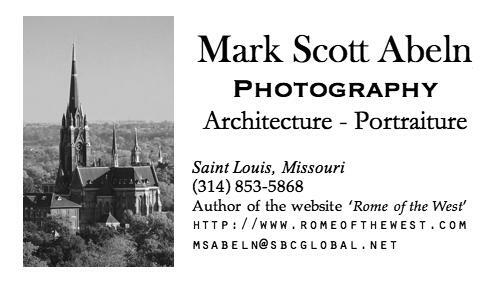 The city was annexed to Saint Louis in 1870. 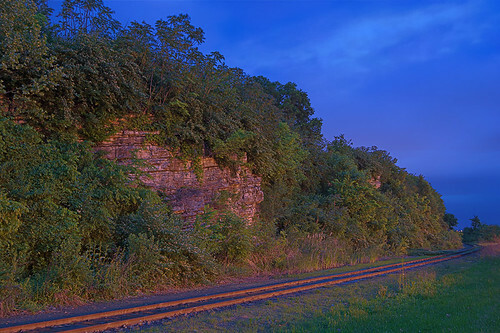 A railroad track runs along the bluffs besides the Mississippi River. The Saint Louis, Iron Mountain, and Southern Railway started a bit upriver at the U.S. Arsenal, and eventually ran to Arkansas, being built to ship iron ore from the Ozarks. For a while, Carondelet was the major iron producing city in the midwest, and was historically, and is currently, an industrial center. Although loyalties were strongly divided here during the American Civil War, Union Ironclad gunboats were constructed in this city by James Eads, while one of his neighbors, in exile, built Ironclads for the South. 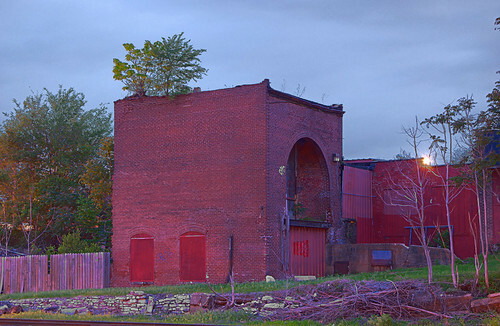 This photo was taken at dusk from the Sister Marie Charles Park on the bank of the river; strong color comes from the darkening blue sky and the park's sodium vapor lighting. Carondelet was founded at the base of this bluff, which is known as the Saint Louis Palisades; the historic urban core of Carondelet remains, while the village's common fields have been subdivided to the west, where part of it forms Carondelet Park, and extended downriver all the way to what became the Jefferson Barracks army base. The architecture in Carondelet is historical, and is often fairly intact. The first chapel here was a Jesuit mission to the Kaskaskia Indians, at the mouth of the River des Peres, from 1700 to 1703. Saint Francis Xavier chapel was built after Carondelet's founding, and later, the Church of Our Lady of Mount Carmel and Saint Joseph of the Angels. The Venerable Felix de Andreis, C.M., served here, and his cause for beatification is promoted by the nearby Saint Stephen Protomartyr Church, which administers the Saints Mary and Joseph Chapel, seen in the photo below. 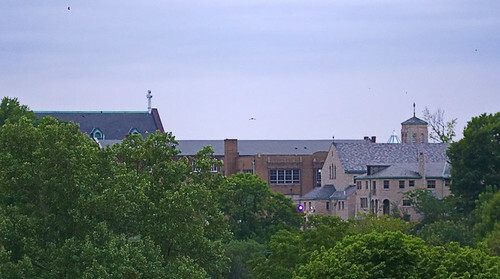 A view of the Motherhouse of the Sisters of Saint Joseph of Carondelet, to the left, and Saints Mary and Joseph Chapel, on the right. Taken from about a half mile away from atop the bluffs at Bellerive Park. Websites about Carondelet can be found here and here. The text of the Carondelet land grant from Spain is here. This map shows the boundaries of the neighborhood; yellow markers are current or former Catholic churches; blue markers are buildings on the National Register of Historic Places. Once again, you score a direct hit. Carondelet is the most interesting neighborhood in the city. Friends and I are trying to figure out how to get someone, anyone, to memorialize the site of the 3rd Kaskaskia village established by the Jesuits in 1700 at the mouth of the River des Peres. I grabbed my wife and we went to tour the area today after reading your post. Give us more info and I'll see he does it. I'm from Carondelet.. The north bank at the mouth of the River des Peres is a vacant, ugly, dangerous former industrial area that used to be a coal gasification plant, but it certainly has lots of promise if plenty of money and effort is taken. The south bank is the new casino. That has plenty of freshly seeded lawn right next to the river, and could be a good location for a monument. There appears to be a new path under construction there - is this a part of the Great Rivers Greenway project? Anyway, that might be a good location. 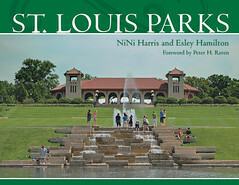 Both banks of the River des Peres are within the City limits. I wonder if the Jesuits would like to be involved with this project? Hmmm. I'm interested, and I also have plenty of time on my hands. Perhaps you can send me an email and see if we can get things rolling on a monument? My email is listed on the sidebar of this blog.